Barbara Gordon as Batgirl really stole the hearts of fans. There are whole tribes of fans that can see the mantle with no one else, and this guy probably creates a few more, every time he walks down the street. Batman is a tattoo no one wants to mess with, and that's exactly how the Dark Knight should be! Look at how well those colours have come out - that's Skin Art Masterclass right there. Catwoman the first of two back tattoos, is based off promo art for the video game Mortal Kombat vs DC Universe. A twist on the feline's popular purple dress mixed with her modern combat look - and enough 'cats eyes' to lose yourself in - means one massively effective tattoo. Finally, what is Batman without The Joker? In what seems like a nod to Brian Bolland's Joker in Batman: The Last Laugh, with the styles of Mike Deodato Jr added in, if I was going to ask any guy to take his shirt off, it would be this dude right here. 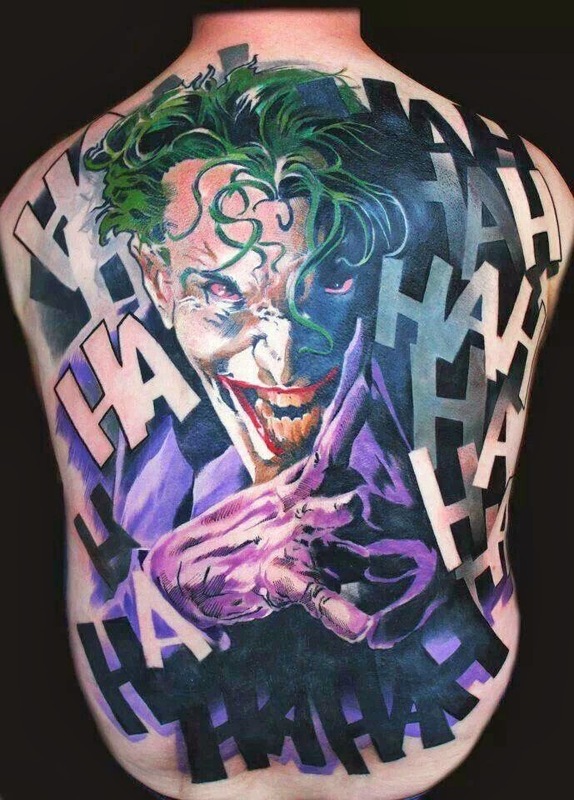 As far as back tattoos go, this is stunning stuff. The Batgirl is really nice, kind of a crappy spot though... Joker works well- but damn that's just a bit excessive. It's not taking a joke to far? Sorry had to go there.